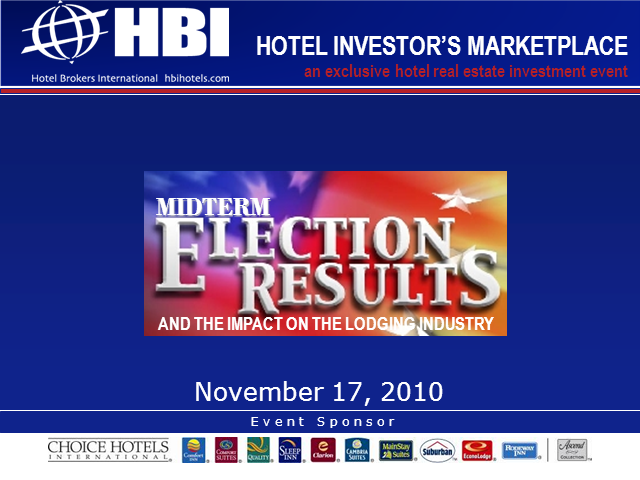 Join the Hotel Investor’s Marketplace Webcast on November 17 as a panel of hospitality professionals analyze the results of the United States midterm elections and the impact they may have on the lodging industry. What ramifications, if any, will this election have on the hot button issues most important to hotel real estate investment and operation? President, Greene, Canfield, DeGeorge, Ltd.
Don’t miss this opportunity to attend the live Hotel Investor’s Marketplace Webcast and ask your questions about the important issues affecting the lodging industry.